Shabby Chic French Wedding Shoot. We have always been fans of finding inspiration from the most unexpected sources, and it was this photo of a jaded cement wall in mauve found in an alley of a small little town in France that caught our eyes. From the well-worn wall, the frayed blue wood windows, the timeworn reddish-brown brick window ledge to the tarnished metal hinges, altogether embody unpolished beauty with age and the essence of time. 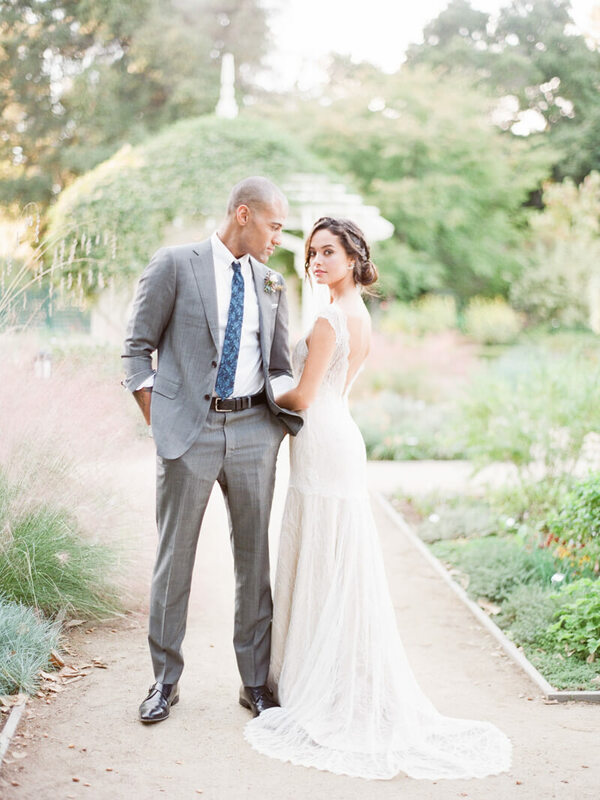 To mimic that French countryside feel in the inspiration photos, the photoshoot took place in Gamble Garden, a semi-casual intimate setting filled with various lush greeneries. The chipped farm table, the corrugated wood and metal bench, brown bottles and cast iron cake stand were styled to showcase the beauty of time. These rustic pieces were balanced with the more refined wrought iron chairs to further express that romantic French garden mood, organic yet elegant. Similarly, the lightly distressed, intricately embossed stoneware were paired with the rustic steel forged flatware to showcase that mix of delicate and crude elements. The moody floral arrangements carry the sprawling garden vibe with touches of mauve, taupe and plum adorned with hints of blue. The watercolor and script stationery design, on the other hand, placed more emphasis on that organic, hand-painted dust blue with accents of deep rose. 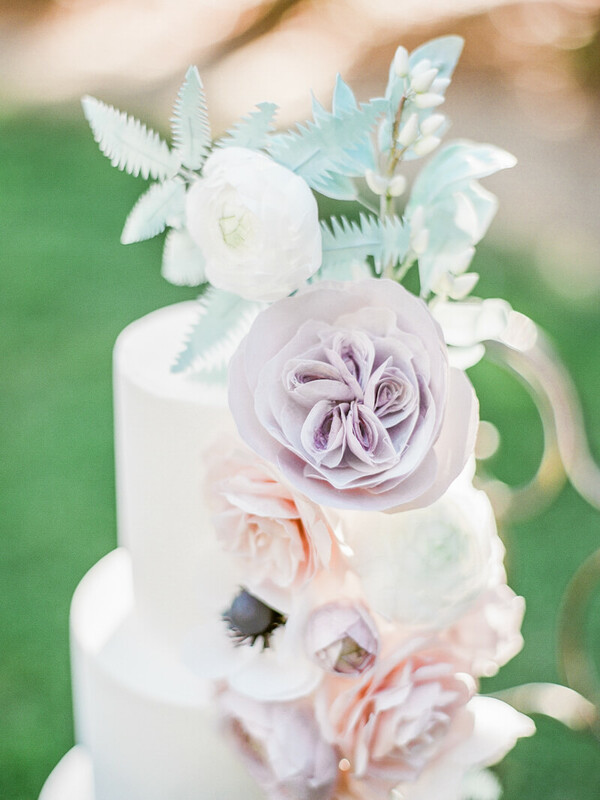 The cake was created with a soft grey gradient, echoing the flowy runner, with artfully made rice-paper décor with muted tones. The dove grey runner was key to this story, it is the tie among all colors and elements as it provided that neutral state and balance between the sophisticated and the unpolished. 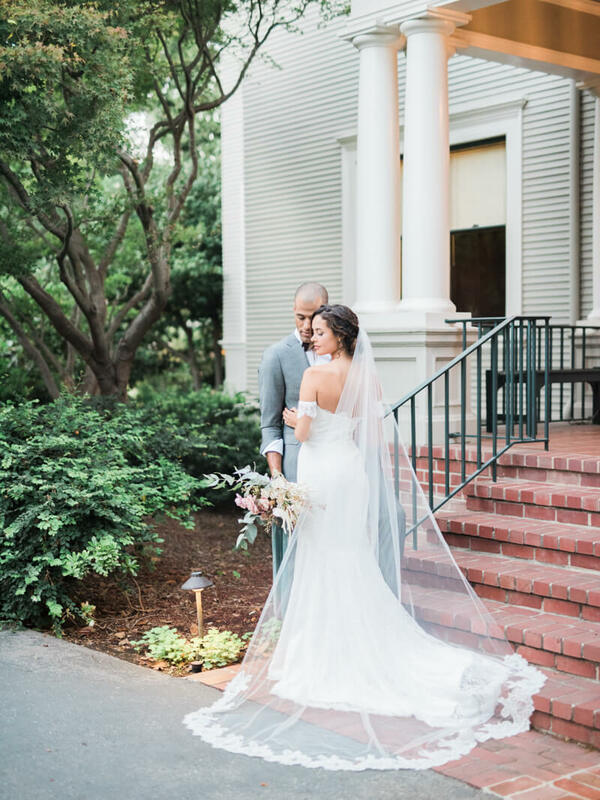 For the groom’s attire, the roll-up sleeve trend was incorporated given the semi-formal setting, and a few European chic elements such as plaid, subtle polka dots, and floral print were utilized in the details. Intricate romantic lacing was the focus of bridal styling for this photo shoot; the first gown incorporated the lovely drop-waist French design with natural inseam, whereas the second look is a fit-and-flare white gown with the unique lace arm cuffs, finished with a stunning cathedral veil with lace trim. The natural makeup with a soft glow along with the effortless, somewhat playful braid and loose up-do were perfect to complete this overall ensemble.